Persistence Market Research presents a new and comprehensive report on the global aesthetics combination therapy market titled ‘Aesthetics Combination Therapy Market: Global Industry Analysis and Forecast, 2016–2024’. The report starts with an exhaustive executive summary that includes the market overview of the global aesthetics combination therapy market coupled with a terse explanation of the drivers, restraints and trends along with a brief mention of the key players operating in the global aesthetics combination therapy market. The executive summary also gives an overview of the most lucrative region in terms of revenue in the global aesthetics combination therapy market along with a split of the market numbers in terms of therapy type, application, end user and region. In the last part of the executive summary, the key takeaways are included, which highlight the overall market approach, target geographies and differentiating strategies adopted by key market players to stay on top in the global aesthetics combination therapy market. After the informative executive summary, the global aesthetics combination therapy market taxonomy is given. The global aesthetics combination therapy market is divided into the following segments and sub-segments. Overall market size has been analyzed through historical data, primary responses, and public domain data. Revenue of companies functioning in the global aesthetics combination therapy market has been benchmarked to ascertain the market size for the base year. Macroeconomic indicators such as GDP and industry growth have been considered to forecast the market size over the assessed period. The historical growth trend of end-use industries, market participants’ performance, as well as the present macroeconomic outlook has been taken into consideration for estimating the overall market trend forecast. This data is then validated with the help of the triangulation method and is extensively scrutinized using advanced tools to garner quantitative and qualitative insights into the global aesthetics combination therapy market. 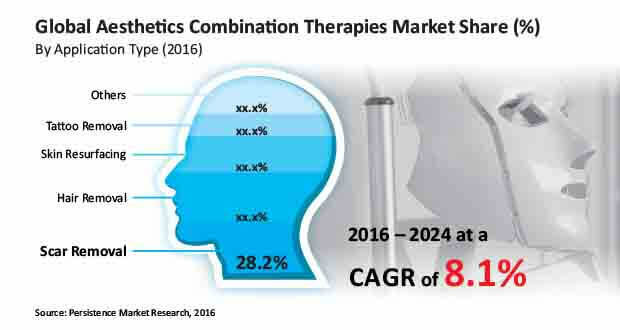 The global aesthetics combination therapy market is slated to grow from more than US$ 2,100 Mn in 2017 to nearly US$ 3,700 Mn by 2024 end. This represents a CAGR of 8.1% over the forecast period. The global aesthetics combination therapy market represents an incremental opportunity of US$ 1,715 Mn between 2016 and 2024. Due to a booming stock market and rising affluence, the increasing spending power in the United States is boosting the market for nice-to-have services, which include various beauty treatments. The rise in disposable income is more visible amongst the affluent class, who make up the largest customer base for advanced beauty services such as facelifts and rejuvenation therapies like dermal filling, microdermabrasion, chemical peeling, laser treatment and others. Other than this, a rising aging population and a burning desire to restore a youthful appearance are the other boosting factors for generating a healthy demand for beauty treatment services in the U.S. However, this phenomenon is not restricted to the U.S. alone. As per World Bank forecasts, the economic growth in the East Asian and Asia Pacific region is expected to be 5.7% approximately in 2017-18, and will continue to remain stable over the next three years. Due to this economic prosperity, the nice-to-have high end services in the beauty industry such as facial rejuvenation are going to have a positive impact. Moreover, private consumption expenditure is set to remain close to 8%, which further boosts the economic sentiment in such regions and leads to a deeper regional penetration of the aesthetics combination therapy market. Such factors are expected to create a favorable environment for the adoption of laser treatments and other expensive treatment procedures in the realm of aesthetics. This is set to boost the global aesthetics combination therapy market. There is an abundance of dermatology service providers in low income countries such as India, Thailand, Malaysia, Vietnam, etc. who tend to prescribe chemical peels and various creams and lotions as the best treatment options for facial rejuvenation. However, in contrast to this, in economically affluent countries such as U.S., U.K., UAE and Japan, the use of only approved Botulinum type-A neurotoxins is seen and in such countries, close to 50% procedures are done using Botulinum type-A injections. Hence, easier availability of products and affordability is set to increase the demand for combination therapy for enhanced results and is therefore set to boost the global aesthetics combination therapy market. Due to intense cut-throat competition, there is a constant pressure on the players in the facial rejuvenation market to introduce newer products, which is still in its nascent stage and in a constant state of flux. Due to this intense competitive pressure, there is a compulsion for early introduction of products, especially peels, topical solutions, etc., which may lead to adverse drug reactions such as skin rashes, pain, hyper-pigmentation etc. Due to such incidents, customer faith is lost and this is likely to restrict overall market growth. In addition, beauty treatments are sometimes not administered properly, which results in severe or adverse side effects. Patients could experience symptoms such as flu, fever, extreme pain and swelling within 48 hours, if the injection is not administered properly and punctures a facial vein. Presently, very few institutes offer training on advanced procedures, and there is a dearth of trained professionals, especially in developing countries, where such treatments are still nice-to-have services. Scar Removal segment dominated the global aesthetics combination therapy market in terms of revenue in 2016, and the trend is projected to sustain throughout the forecast period. Scar Removal segment is also the most attractive segment, with an attractiveness index of 1.5 over the forecast period. Revenue from the Scar Removal segment is anticipated to register a CAGR of 8.5% over 2016-2024, to reach more than US$ 1,000 Mn by 2024. Skin Resurfacing segment is expected to be the second most lucrative segment in the global aesthetics combination therapy market, with an attractiveness index of 1.3 during the forecast period. Skin resurfacing segment accounted for 24.2% value share in 2016 and is projected to account for 25.4% share by 2024 end.